It's always a happy moment to open up that box and see your books all printed up and looking nice. A very happy moment indeed. It's even better to hold the book in your hand. It's quite an honor to have something like this printed up and see it on the bookshelves. Well, I haven't been out that much lately, so I'm assuming the books are in bookstores at this time. Seeing as the book was officially released on the 25th, I'd like to think that yes, the books are available NOW! Go now! Buy buy buy! Spend spend spend! AND, if you could, go to your local independent bookstore to buy your copy of the book there. They'd thank you for it. Coming soon: more photos. (Of course!) And a CHICKS RUN WILD photo contest! Stay tuned. Well, you guys did it! 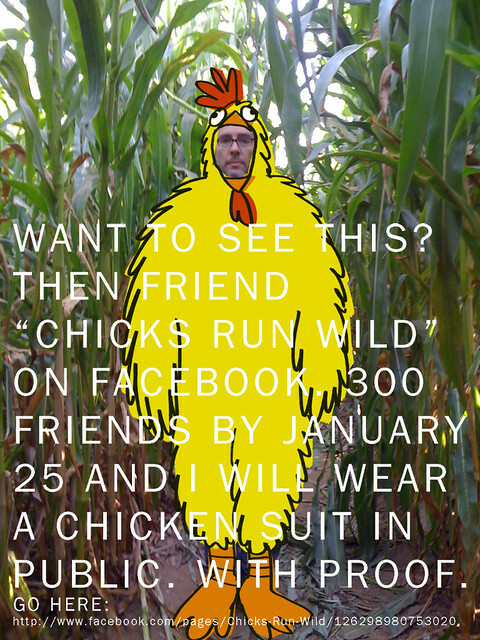 We reached 300 friends (or likes) on CHICKS RUN WILD's Facebook page and now I will dress up in a chicken suit and prance around downtown Portland (and other locations in the city) for all to gawk and ponder at in the very near future. 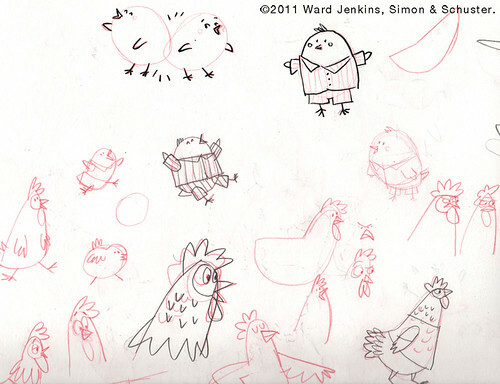 (I've been very busy lately and haven't had the time or energy to do anything chicken suit-related.) I'm actually looking forward to doing this stunt. Very curious to see the reactions I'll get when I walk around town. Pretty sure some witnesses won't even break stride. 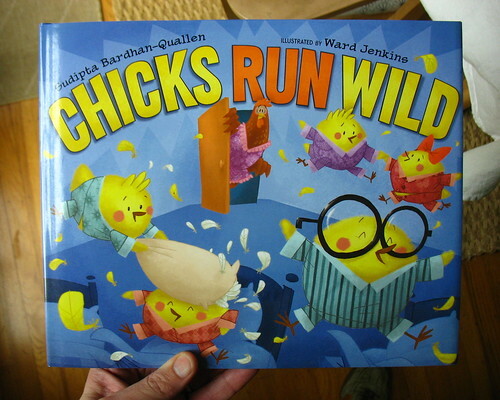 To keep up to date with anything happening with the book, including listings of any appearances or readings that both the author, Sudipta Bardhan-Quallen, and I will be doing for CHICKS, as well as sketches, drawings, artwork, reviews, etc., be sure to like us on the CHICKS RUN WILD Facebook page! 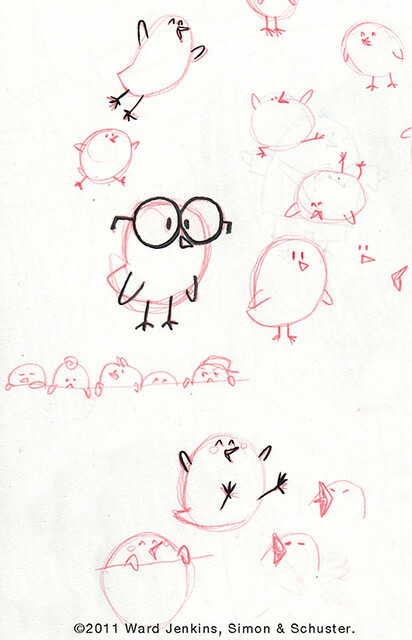 If any kids get inspired to draw their own wild runnin' chicks, we'll post them there as well. Should be a lot of fun. CHICKS RUN WILD will be released on January 25th - in FIVE DAYS. Can't wait! Happy 2011! I know it's two weeks into it, but better late than never, right? Well, what better way to start off the new year than to post a pic of me in a chicken suit? Nothing like good ol' fashioned shameless self-promotion to get the ball rolling for 2011. Yes! 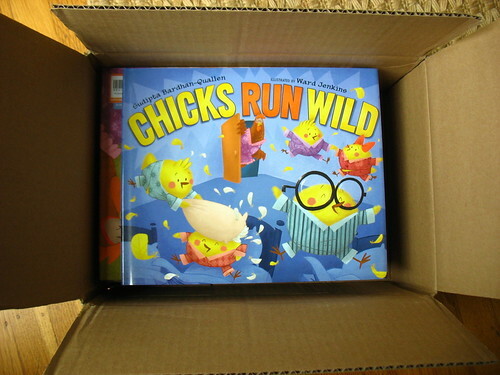 My newest children's book, CHICKS RUN WILD will be released later on this month, on January 25th. 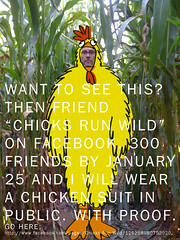 If we get 300 friends (or "likes", however you want to say it) for CHICKS on Facebook, then I'll wear a chicken suit out in public. Seriously. I'll get my wife, Andrea, to take photographic evidence (both photos and video) for those doubting Thomas's out there, and will post it all here and on the CHICKS Facebook page for everyone to gawk at. I mean, c'mon! 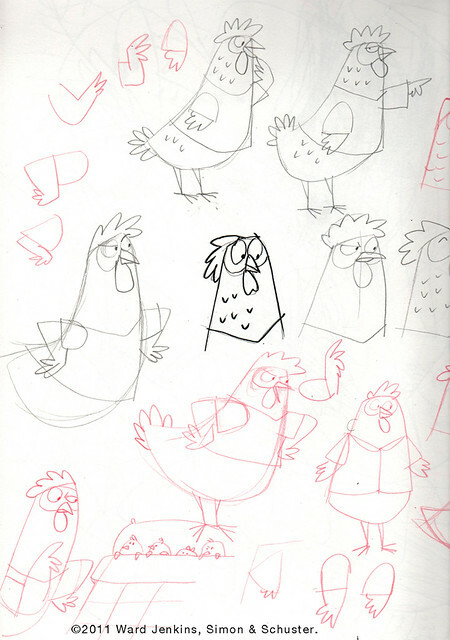 Who wouldn't want to see your favorite neighborhood illustrator don a big suit of feathers and make a big fool of himself? Out in public? I thought so. We've been stalled at around 232. Go tell your friends! Go here: Chicks Run Wild on Facebook. If you'd like to take a look at what's inside the book, you can check out the CHICKS pages on my website HERE.